Though John Blow became Purcell's teacher and famously stepped down from his post as organist at Westminster Abbey in Purcell's favour, in fact the master was only 10 years older than the pupil and the outputs of the two composers intertwine in ways made obscure by the dearth of accurate period detail and dates. So, on this disc the final solo in Begin the song was originally written forr the wide-ranging bass voice of John Gostling and bears a striking resemblance to a passage in one of Purcell's anthems, but we have no way of knowing who inspired whom. 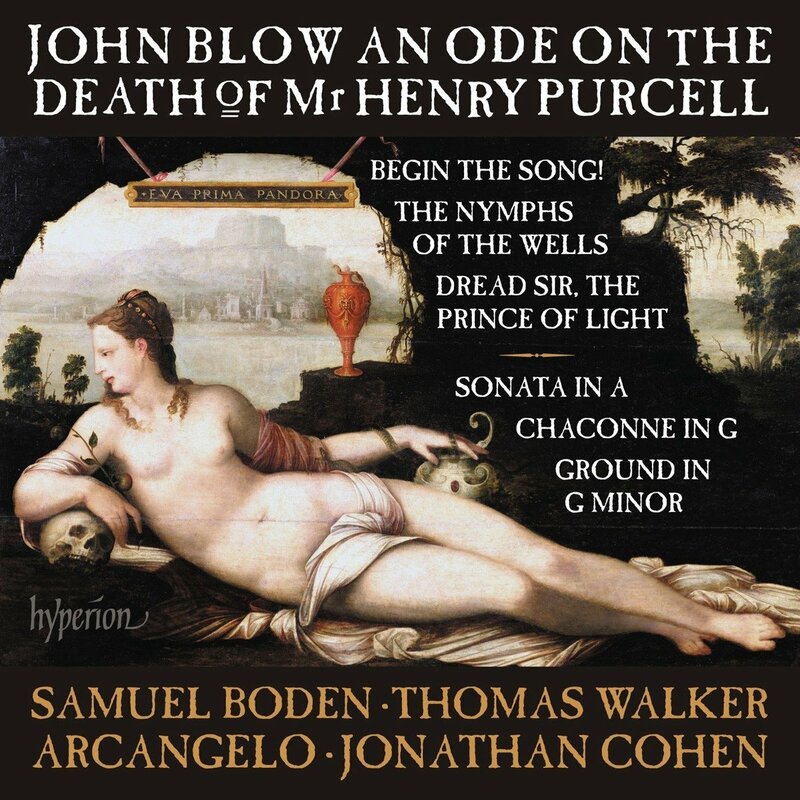 Blow's An ode on the death of Mr Henry Purcell is just one of four odes on the disc, each written for different occasional use. We have only relatively recently begun to properly appreciate Purcell's odes (Robert King's complete recording led the way) and this disc is a welcome chance to explore Blow's output. The Purcell ode, with its text by John Dryden, has the advantage of having the best quatilty text and the others illustrate a problem with 17th century odes, the sheer variable quality of the text can blind you to the imagination of the music. John Blow might lack the ultimate quirky genius that Henry Purcell had, but there is much to enjoy here. The casting shows a striking difference to earlier recording of the Purcell ode, here the main soloists are a pair of tenors singing in haute-contre range, tenor voice with an admixture of falsetto; of course, the nub of this is 'first catch your haut-contre'. Here Jonathan Cohen has a wonderful pair of contrasting voices in Samuel Boden and Thomas Walker. Both capable of some finely heroic singing, but subtle refinement too, and the moments when the voices shade off into falsetto are beautifully handled. The other soloists form a strong group, with all the singing forming an ensemble for the choral tutti sections. Perhaps Callum Thorpe's bass does not quite have the necessary swagger in its lowest reaches, but then who does. This is a richly sophisticated disc, and enables us to enjoy moreof Blow's genius. The odes are more than just Royal Coourt ones, the commissioners were varied, from the public St Cecilia's Day celebrations to the court of Princess Anne. And a group of instrumental works is included too, varying the textures and giving us a further view of this composer. I enjoyed this disc so much, I do hope that Arcangelo might be thinking of a follow-up.